Can Cate Blanchett do no wrong? I feel like, just like Meryl, she elevates whatever anything she is on, and that is certainly true with “Truth.” In this movie, Blanchett plays Mary Mapes, the CBS News producer responsible for the 2004 investigation of President George W Bush’s National Guard sham of a service (an accusation that was never denied by the White House) But, scrutiny of some documents led to her downfall, and eventually Dan Rather’s as well. The movie, written and directed by James Vanderbilt, based on Mapes’ book. This may not be the fairest source for this story, but the film painstakingly recreates this version of what happened, how CBS threw its news division under the bus, instead of protecting their news team. This movie shows how nowadays, sound bites are more important than the actual story, and how small details can obscure the real questions in pertinent issues. I thought it was a fascinating story, and as I said, Blanchett is a joy to watch – we see her embody Mapes’ character, and believe. 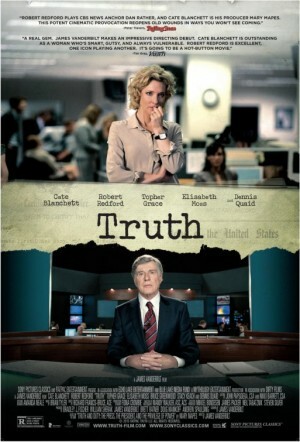 Redford does a more subdued portrayal of Rather, and even though they look dissimilar, Redford captures the newsman’s spirit, and after a while, you cease to see Redford and you start seeing Rather. This is a great his-and-hers performance, and I hope the movie finds an audience. It isn’t doing terribly well, as the film is being buried among the Fall releases.